At this panel, education students who have completed, or are currently in, Clinical 1 will be sharing their experiences, describing what they learned, and providing advice for those taking clinical 1 in the future. They will be discussing the courses you take during Clinical 1 and details of what they did in the schools they were placed in. 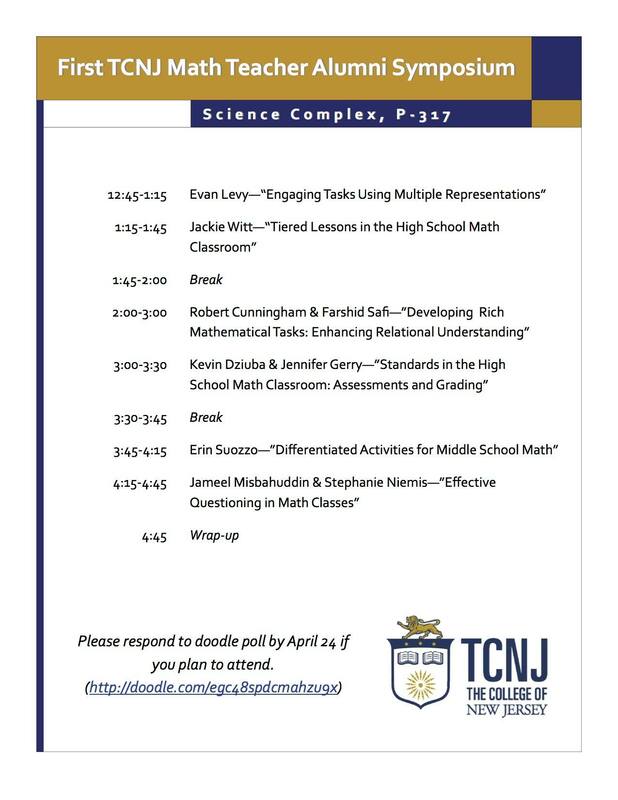 AMTNJ (The Association of Mathematics Teachers of New Jersey) is holding its national conference in East Windsor, NJ, on Thursday, October 25th and Friday, October 26th and is looking for student volunteers to dedicate a few hours of their time! While volunteering you will be able to experience the conference and can even stay to take part in the event! This is a wonderful opportunity to learn why professional development events are beneficial to learn and grow as an educator. At this panel, professors in the mathematics education department will be describing math education courses, and taking any questions attendees may have with regards to classes, clinicals, and requirements. They will also go into detail about their backgrounds and how they got involved in the math education world. Panelists TBD. After the panel, we will be answering any registration questions you may have! We can help you construct a 4-year plan, tell you about all the math and education classes that are offered, and/or help you navigate PAWS. This talk will be given by Dr. Liebars, the Coordinator of the Mathematics Education department and adviser of this club. It will include information on exactly what EdTPA is and its scoring system. EdTPA is not required until we reach Clinical 2, but this talk will provide information so that we are more prepared when this time comes along. The holiday party is an opportunity for students to have some fun by doing math and holiday related activities with the math/stat faculty. This party is an excellent way to relax with friends before the stress of finals kicks in. This event is held by CSTM, Math/Stat Club, and Pi Mu Epsilon. This meeting will be to discuss fundraising and apparel ideas, upcoming events for the semester, and introduce CSTM's 2018 Executive Board! New and returning members are welcome! We hope to see you all there! At this meeting, upperclassmen will be sharing some examples of lesson plans they have done in their education classes and explain how a lesson plan is created. Any questions you have about lesson planning will be answered! At this meeting we will be answering questions regarding scheduling. We will go over the requirements for each type of math education major and discuss the different math and education courses offered by the departments. We can also provide help navigating PAWS and making 4 year plans! 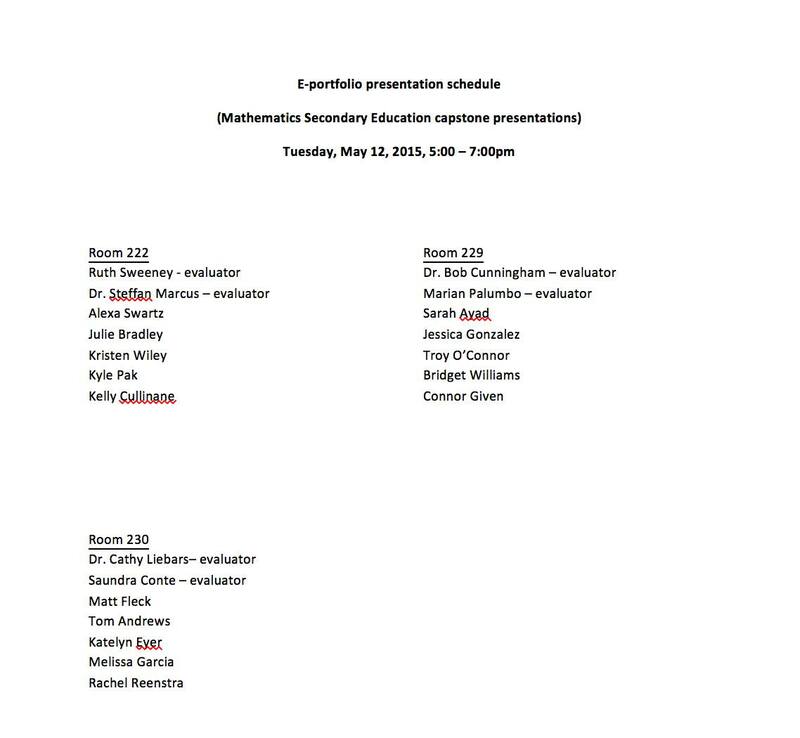 Various students will be presenting their research that they have done on some form of math or math education. They will explain how researching works and all the different ways that you can get involved in research projects! They will also be answering any questions you may have about researching at TCNJ. 1.) Melissa Meddleton: Senior Elementary Education and iSTEM-Mathematics major who's research analyzed how K-12 teachers in NJ and across the US are using technology to teach math and what kinds of technology are being used. She is currently in her fourth semester researching this topic with Dr. Vandersandt. 2.) Kristen Villane: Senior Math Secondary Education major who was an instructional intern for Dr. Vandersandt's Calculus A class. She sat in during one of the sections, held office hours twice a week, and wrote a research paper on what affects student performance. She worked on this last semester and her research paper is almost completed! 3.) Shane Carey: Junior Math Secondary Education major researching Algebraic Geometry with a focus on Affine Toric Varieties with Sebastian Calvo, a junior Pure Math major, and Dr. Marcus. Last semester they dove into Hurwitz Theory, and what they learned from this applies to what they are currently researching. This is their second semester researching, and they plan to continue through next year as well. 4.) Nikki Krysa: Junior Math Secondary Education major who completed an honors by contract in MTT 380 with Dr. Liebars. She surveyed math education alumni and asked them how they incorporate other subjects into teaching mathematics. She specifically looked into which subjects they incorporate. Alumni who have gotten jobs in math education after graduation will be discussing their experiences teaching after college. Join the math/stat department for an afternoon filled with lots of outdoor activities and tasty food! Several professors will be attending and participating in activities as well! This picnic is a great way to relax with friends before the stress of finals kicks in. Hope to see you all there and having fun! During the meeting this Wednesday we will be voting on the new co-community liaison, so any current freshman or sophomores should email us if you are interested in running. This will guarantee you a spot on e-board for Spring-Fall of 2017. It's fun and looks great on a resume, so please email us if you have any questions or are interested in running! We will also be working on the teacher appreciation cards, so everyone should come by and make one to show your appreciation for our wonderful professors here at TCNJ. Click here to sign up to make a card! March 10: 2-3pm in SCP117 Dr. Farshid Safi is visiting TCNJ! Mathematics education programs throughout the country actively seek to engage prospective teachers in meaningful mathematical experiences that prepare teaching candidates while providing a deeper understanding of mathematical content. Recent research efforts have focused on ways in which prospective and practicing teachers’ conceptions of modeling with mathematics would be enhanced through engagement with tasks that impact their content knowledge for teaching (Lesh & Zawojewski, 2012; Pollack, 2012, Usiskin, 2015). In order to effectively engage students in modeling with mathematics, this talk will also highlight standards for mathematical practice involving the strategic use of tools – such as dynamic technologies - and discuss classroom connections. Dr. Farshid Safi has spent the last twenty years working with students and teachers at the K-12 school level as well as teaching mathematics content and methods courses at universities throughout the U.S and Canada. As a public school mathematics teacher, he has taught courses ranging from algebra to advanced placement calculus courses. He received his Bachelor’s and Master’s in Mathematics from the University of Florida and received his PhD in Mathematics Education from University of Central Florida in 2009. From 2009-2015, he was a mathematics education faculty member in the Department of Mathematics & Statistics at The College of New Jersey (TCNJ). Currently, he is a mathematics educator in the School of Teaching, Learning and Leadership at UCF in Orlando where he works with undergraduate as well as Master’s and Ph.D. students focused on mathematics education. His primary research focuses on developing teachers’ conceptual understanding of elementary and secondary mathematics and connecting essential mathematical topics through the use of multiple representations and technology. Dr. Safi has written articles for national and international journals and presented at state, national, and international conferences. He is a member of the National Council of Teachers of Mathematics and Association of Mathematics Teacher Educators (state and national levels) and has served in leadership positions for both organizations. March 2- 2:30-4 SCP230 "Why do education majors have to take upper-level math classes?" Counts towards Capstone Seminar Requirement for all Math Ed Majors! This is a great opportunity to meet administrators, educators and fellow preservice math teachers from all over the region. Come hear Jess Martin, Illana Feldscher and Nick Brion as they share their JFE Experiences! This is a great opportunity to get involved in CSTM and the math department! Mr. Harris earned his Master’s degree from TCNJ in 2000 and became a high school math teacher in Edison for 8 years. Later he became the Assistant Principal at J.P. Stevens High School, and in 2013 he became the Principal at Grover Middle School in West Windsor. After graduating from Temple University, Mrs. Bean taught all levels of mathematics at West Windsor- Plainsboro High School South for 20 years. Following high school, she taught 3 years at Thomas Grover Middle School and earned my Master’s Degree at TCNJ. She is currently the District Supervisor of Mathematics for grades 6-12. She also serves as a member at large for the Association of Mathematics Teachers of New Jersey. Donald Wahlers earned a B.S. and B. A. from Pennsylvania State University and a M.A. from Rider University. He spent ten years as a high school science teacher followed by ten years as K-12 Supervisor of Curriculum and Instruction in Mathematics and Science. He is currently starting his focus on Curriculum and Instruction for STEM in grades K-6, where he looks forward to developing an integrated instructional experience to foster a strong foundation to support students in further studies in mathematics, science, technology, and engineering. Meeting #1- Wednesday, September 10! Meeting #2- Wednesday, October 1! The Association of Math Teachers of New Jersey (AMTNJ) is currently celebrating its 100th year. Invited to this conference are many notable figures in the math education, such as NCTM past and present presidents, other NCTM officers and the writers of the CCSSM. Counts as Capstone Seminar Requirement for all Math Ed Majors! Meeting #3- Wednesday, November 12! What IS and what AIN'T Stats...The CCSS, the PARCC, and Teaching Statistics in the Algebra Classroom- Wednesday, November 19!! ﻿Counts as Capstone Seminar Requirement for all Math Ed Majors! Whereas most people confuse probability for statistics, the new Common Core State Standards expects 12 year olds (and their teachers) to be able to "use random sampling to draw inferences about a population." In short, seventh graders are supposed to be exposed to concepts in inferential statistics. This reality, and a dozen more examples of statistical knowledge that must be included throughout the 6th, 7th, and 8th grade curricula, as well as the Algebra I and Algebra II curriculum, are the focus of this dynamic (and fun) 45 minute presentation. Adam Shrager is an adjunct faculty member in the department of Mathematics and Statistics at The College of New Jersey, and also teaches courses in Statistics and Applied Finance at Princeton University's Woodrow Wilson School of Public and International Affairs. He is a full time teacher of AP Statistics and Mathematics at Hopewell Valley Central High School in Pennington, NJ. He is a former Wall Street executive who has also written a best-selling book about Star Trek: The Next Generation.